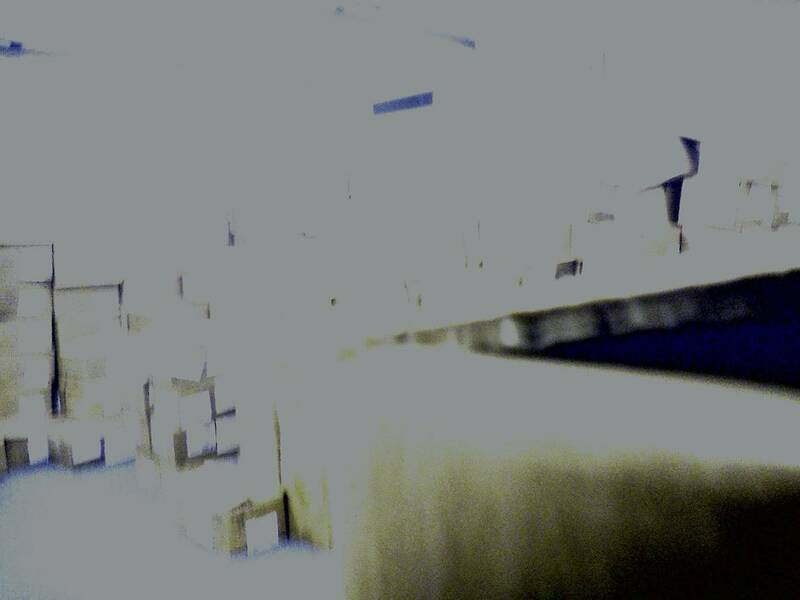 Individuals of SCP-1355-1, amongst identical storage boxes. An example of a camera malfunction believed to occur when SCP-1355-1 is in motion. Special Containment Procedures: The property surrounding SCP-1355 is currently under Foundation management, and is to remain fenced off under the guise of an ongoing renovation. A security perimeter patrolled by guards is to be maintained at all times. Any civilians attempting to approach SCP-1355 are to be turned away under the pretense of keeping the renovation site clear. As SCP-1355 possesses no windows and equipment installed in SCP-1355 periodically malfunctions, the building is to be remotely monitored using thermal imaging. Due to the results of Incident 1355-1-23, as part of safety measure 1355-A23 electricity is provided to the building. All lights within SCP-1355 are to remain on for twelve hours each day, operated by a switchbox located outside SCP-1355. A population count of SCP-1355-1 is to be carried out weekly. Description: SCP-1355 is a one-story building located in the old ██████ █████ school district of █████, ██████████. Records recovered from the city’s archives list the building as an elementary school scheduled for renovation. When initial investigations were carried out by the Foundation, SCP-1355 was being used as a temporary book storage site. 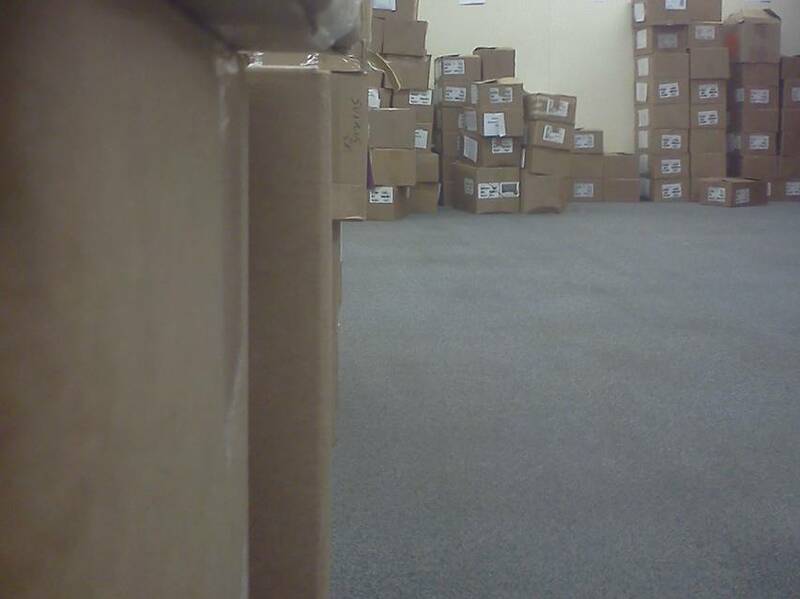 As such, furnishings within SCP-1355 consist primarily of tables, small chairs, and numerous stacks of boxes containing textbooks. SCP-1355 is believed to be inhabited by a colony of life forms, designated as SCP-1355-1. Individuals of SCP-1355-1 are believed to be visually indistinguishable from the textbook-containing boxes stored in SCP-1355. Thermal imaging has revealed that individuals of SCP-1355-1 possess a thermal signature similar to that of humans; however, the signature dissipates while SCP-1355-1 is in motion. Attempts to capture a specimen of SCP-1355-1 have failed. Subjects recovered from SCP-1355 were rendered incapable of phonation or voicing. Resonance imaging has revealed the larynx of each subject to be missing. Notably, none of the subjects appear concerned over or even aware of their loss; subjects are convinced they are able to use and hear their voice, despite being informed otherwise. Note: All Class D subjects who have encountered SCP-1355-1 during experimental exploration were recovered from the front office of SCP-1355; all appeared to be asleep and none could remember how they came to arrive in the office. Personnel charged with subject recovery reported no sightings of any beings which may have been responsible for relocating the subjects. What did you hear when you entered the building? Do you remember which room you were in when you began to hear something? Did you recognize what you heard? I think it was called Love’s Greeting. Salut D something. It played at my sister’s wedding. Describe the quality of the sound. Happy. Very happy, like I couldn't remember anything sad ever happened to me. Did you make any vocal noises in response to what you heard? Do you remember falling asleep in the building? Not really. I remember waking up. Can I go back there? I believe I heard people singing. One of the smaller rooms. Most were empty, but the one I remember had some boxes in it. Did you recognize what you heard? What was it? Some song my father used to sing to me; a lullaby. Wonderful. Amazing. Like a choir of angels. A little sleepy, but peaceful. I've never felt so peaceful. It was so soothing. Of course. I sang along. Not at all. I must have dozed off somehow. I would like to go back. I want to hear it again. Sounded like singing or something. My favorite song when I was little. Awesome. It was so beautiful. I could have listened to it forever. I want to listen more. Take me back there. Let me listen again. Addendum 1355-1: As part of preliminary trials for Experiment 1355-1-5, █ “voiceless” subjects were allowed to reenter SCP-1355, one at a time, while the test was documented using a series of thermal imaging cameras. See experiment log 1355-1-5-D19574. Time: ██:04:12 Individuals of SCP-1355-1 distinguishable by thermal signature. Visual indicates several individuals of SCP-1355-1 scattered throughout multiple rooms of SCP-1355. Time: 18:05:43 Subject enters SCP-1355. Time: 18:06:35 Subject walks through SCP-1355. SCP-1355-1 seen quickly converging into a single room. Time: 18:08:23 Subject enters room containing entire colony of SCP-1355-1. Time: 18:09:22 Thermal signature of SCP-1355-1 disappears. Time: 18:09:24 Thermal signature of subject disappears. Time: 18:09:48 Thermal signature of SCP-1355-1 reappears; individuals of SCP-1355-1 are shown scattered throughout the room. Time: 18:11:37 SCP-1355-1 individuals move to different rooms. Thermal signature of subject undetected. Addendum 1355-2: As of ██-03-20██, Experiment 1355-1-5 and any similar testing have been suspended indefinitely. Addendum 1355-3: It has been noted that two days after Experiment 1355-1-5 was carried out, the population of SCP-1355-1 was observed to have increased by approximately ██.